We have a few new toys floating around this house since Kaleb just celebrated his second birthday (and we made sure to have the grandparents get things that could be used in our tot time). I do have to say, that my little bug is blowing me away with the things that he has been learning and doing these last few weeks - things are really beginning to click together in that little brain of his. Speech is growing in leaps and bounds with new words every day. And hearing that sweet little voice and the pronunciations just melts my heart. Since the new toys are such a hit, we played with those a LOT - and Kaleb has already mastered one of his new puzzles (sigh). 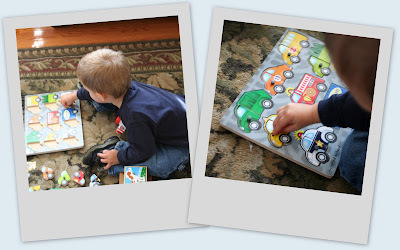 This is a puzzle by Melissa & Doug where the front of the vehicle needs to be matched to the back. Kaleb has been hysterical with it. He puts the puzzle pieces in the wrong spot, looks at me with a silly smile and says, "heeya?" (here?). Then giggles and puts it in the right spot. 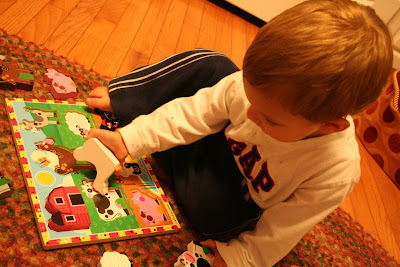 He's naming almost all the animals now and we used our farm puzzle to work on their names and their sounds as well as our Little People barn. Every vehicle is currently a "tractor" but it's still fun to play and make the noises together! 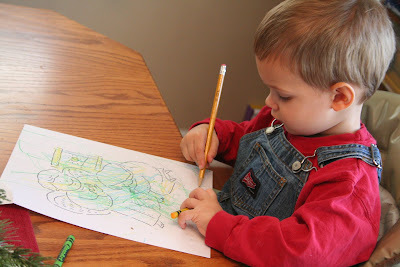 Lately, he has also enjoyed sitting for long periods of time to color along with his older siblings. Some days this week it's been coloring an advent picture for devotions or just having fun scribbling and repeating the color names. 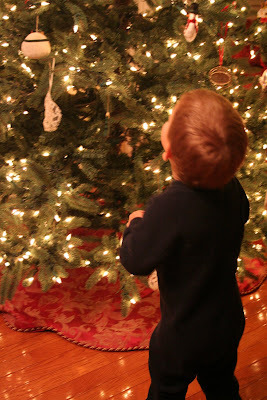 When we decorated our tree this week, Kaleb suprised me when he would hand me an ornament, point up to the top of the tree and say "high!". It just never ceases to amaze me how quickly kids pick up things and absorb when you don't even realize it - and you would think with him as my fourth, it wouldn't be such a shocker! That's about it for this week. Be sure to head over to Carissa's at 1+1+1=1 to view some more Tot School posts. those puzzles look like alot of fun! How fun! I have never thought about "Tot School!" I have just always included them in everything I do and give them plenty of experiences through play. I will have to think about this! 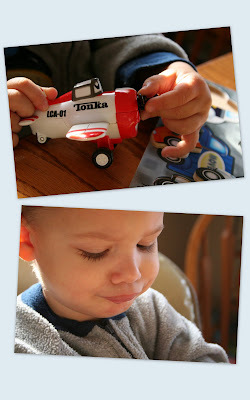 I wish I could talk our kids' grandparents into buying educational toys for birthdays / Christmas presents! What a great idea. And your kiddos are precious! Have a great week!